A whimsical bouquet that is sure to bring joy to any recipients heart. This bouquet comprises a lovely mix of two-toned tulips in cream tinged with yellow and peach accented with orange and the whole display is accented with gorgeous greenery, wrapped in white lace, and presented in a classic glass vase. 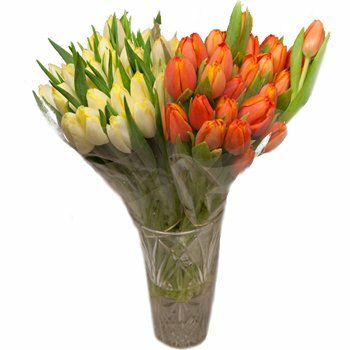 Perfect for Housewarmings, Secretary's Day, Mother's Day, or Easter the Tiptoe Through the Tulips Bouquet will be remembered long after the blooms fade.